Hubs is a ride share application that uses points of interest as primary destination & pick up spots called hubs. "In the Greater Toronto Area, it can cost more than $500 a month to commute. It's going to be a sizeable portion of your budget." How can we design a viable product for commuters in order to alleviate massive commuting costs and their time of travel. This is in response to a MaRS Discovery District social challenge. A ride sharing system that is based on carpooling and using major points of interests as a common destination / pick up points. Hubs helps commuters lower their commuting costs via a carpooling system. The product allows users to request rides on the go or schedule ahead of time if needed. 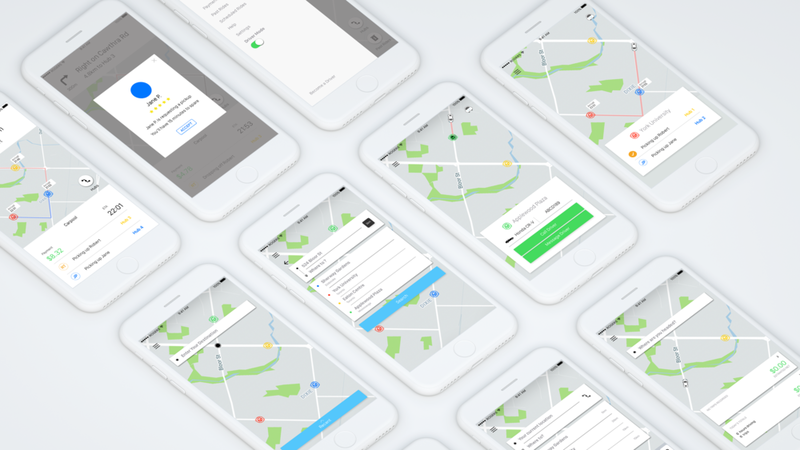 Hubs connects people and capitalizes on their common destinations, saving time and expenses. A byproduct of this solution would also be reducing the traffic going in and out of the city and the CO2 emission rates. To being bringing our product to life, we first had to empathize and understand the current standing of our target audience. We started by conversing with commuters of all ages and backgrounds (Students, 9-5 workers, single living, and family living). Our conversations educated us in understanding the daily challenges of commuting in and out of the city. Following our primary research, we then moved onto creating a PACT analysis that helped our team get a general understanding of commuters and the pain points we wanted to help alleviate. Additionally, we also conducted a competitive analysis which helped us further understand the technicalities and current user experiences of similar products. Introducing version 1.0 of Hubs! View our interaction designs below. Our application starts off with an on-boarding tutorial to walk the user through the overall features of the application. It allows the user to understand the application before using it and does not overwhelm them later on. As a passenger you first input your destination just like any other ride share application. The closest hubs will appear on your map and you decide which one to go. We’ll even show you directions to the hub itself and the trip cost. You will then be matched with a driver and will also be updated during the ride itself to where you are at in your trip! In addition to a passenger, you can also switch to a driver mode! As long as HUBs qualifies you as a driver you will be able to start driving and start earning! Along your route, you can accept or reject pick ups from passengers depending on your schedule and you can also view how much you are earning as you are driving!